Mofongo is a popular Puerto Rican dish, made from fried green plantains or fried yuca, seasoned with garlic, olive oil and pork cracklings, then mashed. Mofongo is usually served with a fried meat and a chicken broth soup. Mofongo is generally made from fried green plantains, although fried yuca or breadfruit are possible, which is mashed together with broth, garlic, olive oil, and pork cracklings or bits of bacon. It is often filled with vegetables, chicken, crab, shrimp, or beef and is often served with fried meat and chicken broth soup. 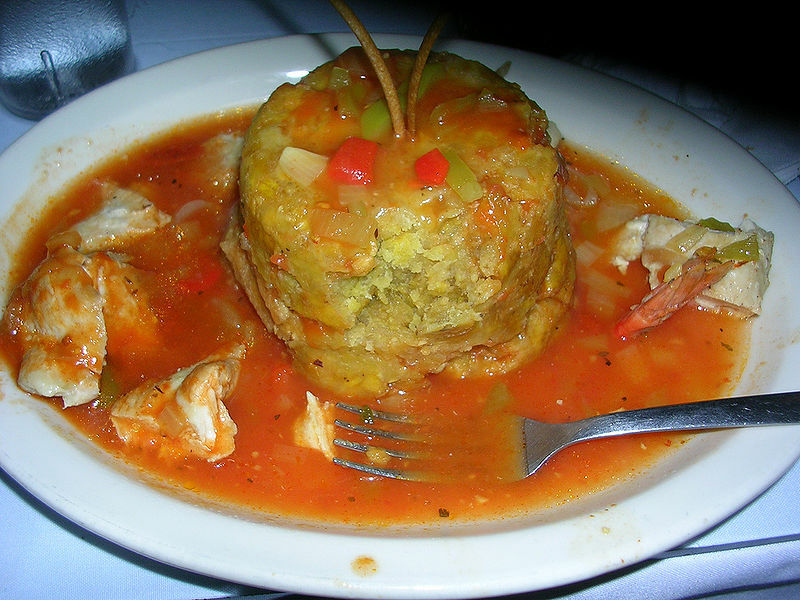 Mofongo relleno is mofongo stuffed with stewed beef, chicken or seafood, with stewed sauce poured over. The soup served with mofongo is often seasoned with saffron. The dish is ultimately of African origin and is a variant of a dish called "fufu" which is made from various starchy vegetables and was introduced to the Caribbean by Africans in the Spanish New World colonies such as the Dominican Republic, Cuba, and parts of Puerto Rico. But unlike mofongo where unripened plantains are fried, then mashed, fufu is made of either green or semi-ripe plantain boiled then mashed. Both fufu and mofongo are seasoned after the plantains are cooked and mashed. Monfongo is made by mashing tostones (twice fried plantains) with garlic, olive oil, and chicarrones or bacon. Makes about 3 medium size balls. Mix together the garlic olive oil and chicharron or bacon. Mash the tostones, a few at a time in the pilon (never use a food processor), adding a little bit of the garlic mixture. You will have to work a few slices at a time. When all done, mix all the batches together for even distribution of seasoning. Add salt if needed. This is a side dish that needs to be served warm. Keep forming balls until mixture is all used up. Serve with fried pork meat and fried onions, or with soup, or as a side dish. Use this same recipe to make "Bolitas de Mofongo" to add to stews. Shape the mixture into balls and drop in any soup.